This fortnight at Crafting with Dragonflies our theme is Baby Cards. I used the fork trick to make the bow with seam binding from Paper Sweeties. I added extra color to the ribbon with my Frost Blue Copic marker, which also stiffened it. I tied the silver stork charm onto it. I stamped the trio of stars in Orange (Craft Smart), Baja Blue & Coral (Quick Quotes) inks. The stamp was made with a bottle cork & wood veneer stars, as inspired by Hand Made Kultur. 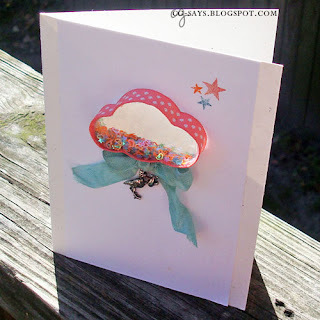 The card base is from the cloud shaker card kit by Jillibean Soup. I used ZipDry silicon glue to wrap the plastic cloud with a coral-colored, polka-dotted ribbon from my stash. I filled the shaker with orange & blue glitter shapes (Recollections) and sealed it with a piece of scrap acetate. Update: Wow, this was chosen as a Designer Spotlight for the We Can See Clearly Challenge at SSSMC! This is the coolest shaker card I've ever seen! I love the stork charm! 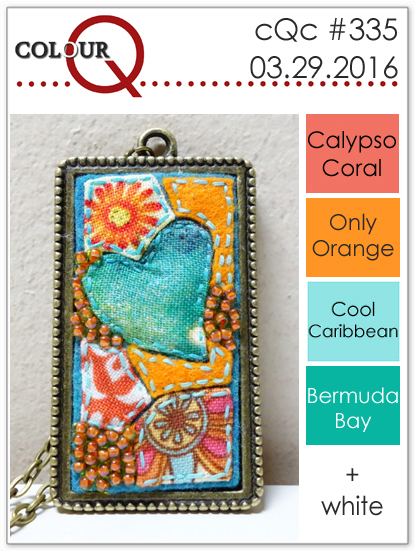 Thanks for playing along with us at colourQ! What a wonderful shaker card you made. Perfect for welcoming a new baby to the world. Thanks so much for playing along at ColourQ this week. Awwww...what a great baby card! The shaker cloud is awesome! Thanks for playing along with us! 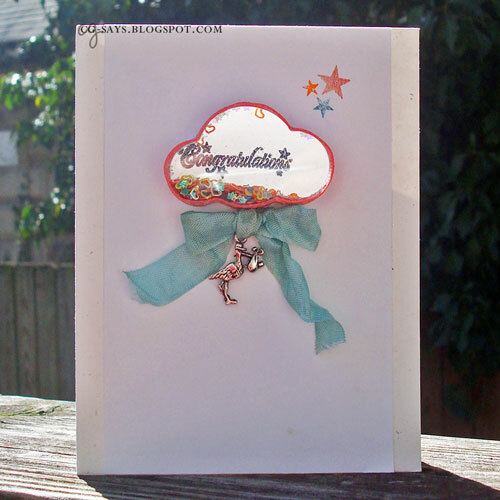 Lovely CAS card! 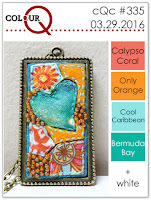 Thanks for joining the Craft-Dee BowZ challenge for April and good luck!